Fiona Dunbar's Kitty Slade Mysteries series is not simply an updated take on Nancy Drew, with mysteries to solve and clever kids turned detectives. In Kitty Slade, sassy modern teen meets history courtesy of spooky ghosts. Kitty Slade herself is a streetwise and well-drawn teen, very much of our world, who turns out to have a special knack for attracting the distinctly unworldly. The series will appeal to girls who like realism as well as fantasy, and to readers who like a touch of horror, but not too much. Kitty Slade is definitely cool: a London kid with attitude and eyeball rolling to match. But she's a teen with a secret: she has inherited phantorama from her Greek mother. Phantorama is the ability to see ghosts and, as Kitty finds out, eventually communicate with them. Kitty finds out about her unwished-for talent in the hilarious first chapter of Divine Freaks, the first book in the series. In the middle of biology class, to the bemusement of both her classmates and least favourite teacher, a freaked-out Kitty is confronted with 'Rat-Man': a gruesomely unappealing ghost who seems intent on communicating with the living. Once Kitty figures out that she hasn't flipped, she starts to wonder why a ghost should be resident in the school biology lab. When Rat-man starts haunting Kitty, finding out why and when he died becomes top priority. The mystery seems somehow tied to rich Roderick Eaton, owner of Eaton Antiques. Kitty, her gran and younger siblings rent the flat above his shop on the Portobello Road and now Eaton wants to evict them. 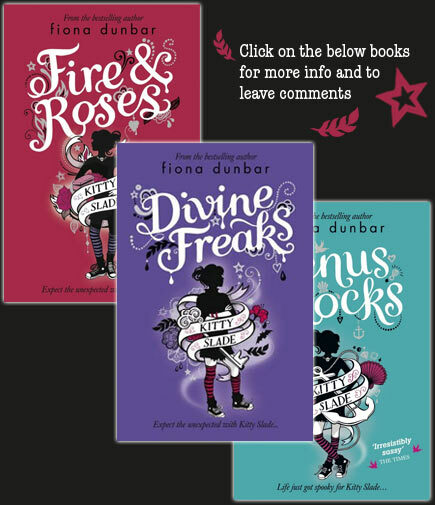 Divine Freaks is a great start to the series and with each successive book, Dunbar hones her premise. The second book, Fire and Roses, finds the Slade family travelling round Britain in a caravan, being home-schooled by the delightful Maro – their Greek grandmother. And now Dunbar introduces the element I find most appealing about these books: modern teen meets ghosts with a past. Dunbar is able to pick and choose historical periods and events that will fascinate young readers. She has fun with the Regency period in Fire and Roses, which involves a 18th century feud between members of the Hell Fire club and spooky scenes in the Chilterns cave where the notorious society held meetings. Kitty is clever and determined, and the friendship between Kitty and her younger brother and sister, Sam and Flossie, as they work to solve the mystery, is well drawn and adds real warmth to the books. Venus Rocks, the third book in the series, boasts a girl pirate, ghost ships, and a fantastic Cornish setting. Lost love, missing treasure and a vicious ghostly villain make for a page-turning book certain to hold the attention of readers, and especially girls, aged nine plus. With each new book in the series, the Kitty Slade Mysteries become even more compulsive reading, and I'll be joining other readers impatiently awaiting the next instalment, Raven Hearts, out in August. I totally agree. The Kitty Slade books are just what's been missing lately from the middle grade fiction market - exciting ADVENTURES for 9-12 year olds with a heroine as main character! Brilliant, pacy stuff! There sound fabulous. My daughter is likely to love them and i have major plot envy! Not as addictive as Harry Potter but it is unfair to compare Dunbar to Rowling. 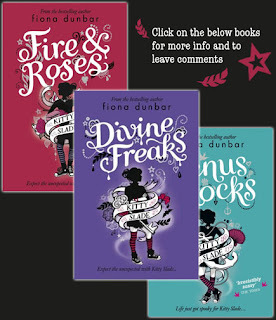 I love the Kitty Slade books very much, I have lent 'Divine Freaks' to my friend and she still hasn't given me it back! A must read for me!